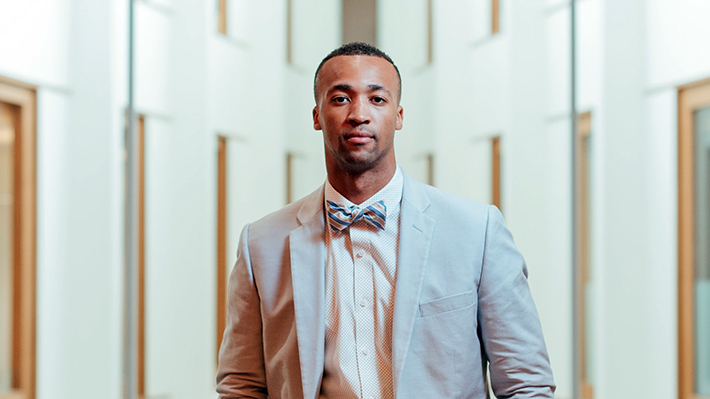 Leonard “Lenny” Hayes III credits the critical thinking skills he gained in Drexel LeBow’s MBA program for empowering him on his steady career ascent. From helping his family run a local basketball nonprofit to managing his team at JP Morgan Chase & Co., Hayes says the lessons learned in the program have enabled him to thrive. Becoming an associate at JP Morgan Chase & Co. wasn’t always on Hayes’ radar, and after graduating from Stony Brook University with a degree in business management, the college baskeball star was still unsure which area of business was right for him. While exploring his career options, Hayes followed in his family’s footsteps by playing for Stony Brook University’s basketball team during his undergraduate studies. During that time, Hayes’ parents began a nonprofit, The DuBois Gravey Foundation. Located in the Camden area, the program uses basketball to foster self-discipline and personal development in participants. Upon finishing his LeBow MBA, Hayes took a position as a senior analyst at JP Morgan Chase & Co. He used his management and critical thinking skills to work his way up to associate only six months after beginning the position. “We’re in a new team and we’re doing new things in financial reporting that haven’t been done yet in the analytical space. So we are basically figuring out who does what well is really what helps our team succeed,” he says. Hayes’ application of his business education and skills extends beyond the corporate office to the basketball court. Since its inception, Hayes and his family have grown the nonprofit from three enrolled students to managing roughly 85 high school students a year. Working as the director of operations for the organization, Hayes says his involvement allows him to encourage students to look outside of what they may see in their neighborhoods. “It’s nice being able to show them, ‘Hey, look you can achieve this.’ A lot of times they have great potential, they just don’t know what they capable of,” he says.